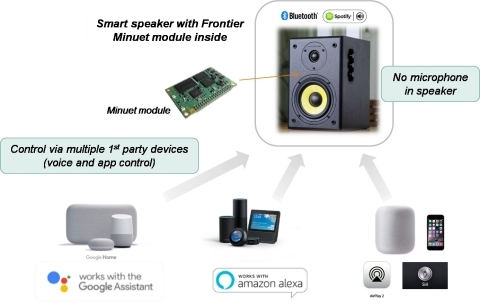 Frontier’s new “WorksWith” reference design is powered by the company’s well-established Minuet Smart Audio module and SmartSDK. This upgrade enables Smart Audio products, without built-in microphones, to be controlled by any voice-enabled device incorporating Google Assistant, Amazon’s Alexa Voice Services, or Apple Siri – giving consumers the freedom to choose their preferred voice ecosystem. Manufacturers and brands will be able to position their devices as being controllable via any of the major voice assistant ecosystems, i.e. their product “Works with Google Assistant”, “Works with Alexa” and can be voice-controlled via an Apple HomePod. In addition, the platform also supports multiroom applications with Google Chromecast built-in and Apple AirPlay 2. The first product based on Frontier’s “WorksWith” reference platform comes from TechniSat Digital GmbH, who will be introducing their new all-in-one music system at IFA, Berlin in September. The DIGITRADIO 581 all-in-one music system supports Works with Google Assistant, Works with Alexa, Works with HomePod, Chromecast built-in, Airplay2, Internet radio, DAB/DAB+, FM radio, CD, USB playback. Frontier Smart Technologies is the world’s leading supplier of technology solutions for digital audio devices. Customers supplied by Frontier include Bose, Denon, Grundig, harman/kardon, Hama, JBL, Marshall, Onkyo, Panasonic, Philips, Pioneer, Pure, Roberts, Sony, TechniSat, UrbanEars, Yamaha, and many more. TechniSat Digital GmbH was founded in 1987 with the objective of offering high quality satellite reception technology to customers. Since then, the company has implemented solutions for receiving and connecting data for German-speaking countries. Today TechniSat is one of the leading German manufacturers of entertainment electronics products. TVs, digital radios, smart home and other lifestyle electronics are on offer. TechniSat develops in the company's own research and development center in Dresden and manufactures in its own production locations in Germany and Europe. With its highly-qualified staff, TechniSat offers development, production and service under one roof. TechniSat creates unique solutions for the world of tomorrow in an innovative working environment. Around the world, the TechniSat Group employs about 1,250 people. TechniSat is part of Techniropa Holding GmbH, a successful group of companies which stand for best consumer electronics, tubes and tube accessories, e-mobility, fine spirits and wooden furniture unique items.